Pregnancy is a beautiful and exciting time in the life of every couple. There are no words to describe the happiness when the female got to know that she is expecting. In these nine months, she faces several types of situations like feeling fear, looking to have sweets or on the other hand looking for salty food, stress, feeling low, demotivated, vomiting, severe pain sometimes, headache, blood pressure problem, etc. Feelings of several types of situations require the extra precaution for this period to have a healthy baby. It is equally important for both the mother and the growing baby. 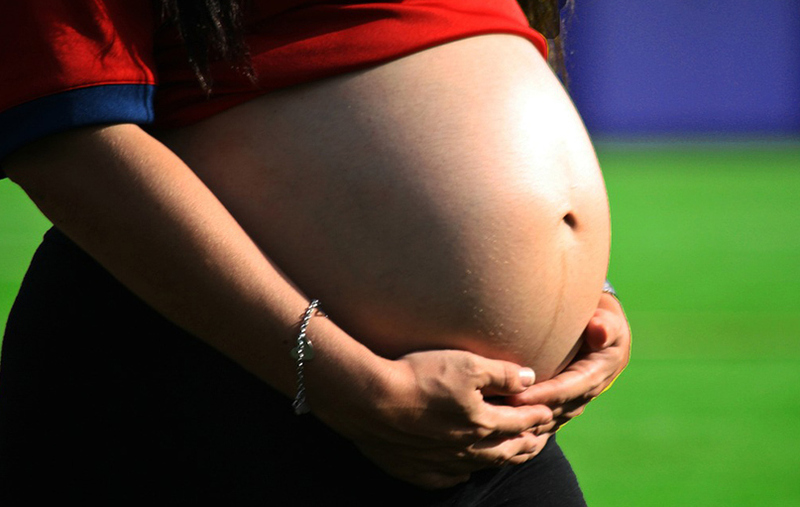 Here in this Post, we are sharing few Pregnancy Tips to have a Healthy Baby. The moment you find out pregnancy, you need to select the right doctor. Early organizing the care helps you to get good advice for healthy pregnancy from the start itself. Normal delivery must be preferred over cesarean delivery as the mother would take less recovery time in normal delivery and there are no side effects. On the other hand, recovery time is more and there are few side effects as well in cesarean delivery. Diet plays a very important role during pregnancy. A healthy diet is important for both mother and baby. Fresh fruits, green vegetables, dry fruits, etc. are necessary to include in the diet to get all necessary nutrients like vitamins, calcium, etc. The doctor recommends several medicines and few supplements during pregnancy. 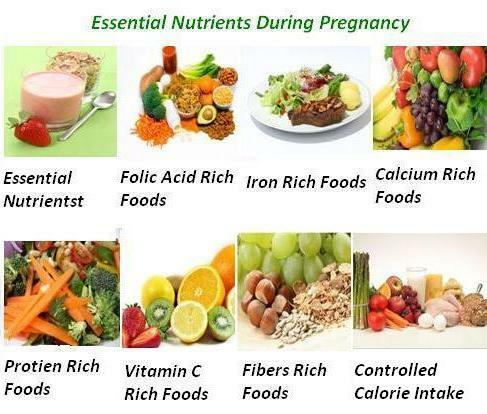 The most common are folic acid, iron, calcium, etc. Please take all these medicines properly as per instructions issued by the doctors for the healthy growth of the baby. Exercise is very important for the health of the mother. It helps in controlling weight, improving blood circulation, etc. At least 1 hour in the morning and 1 hour in the evening is good enough for the health of the mother. Yoga would be a good option. It is mandatory to take the advice from the doctors before practicing any exercise or Yoga so start only after consulting the doctor. 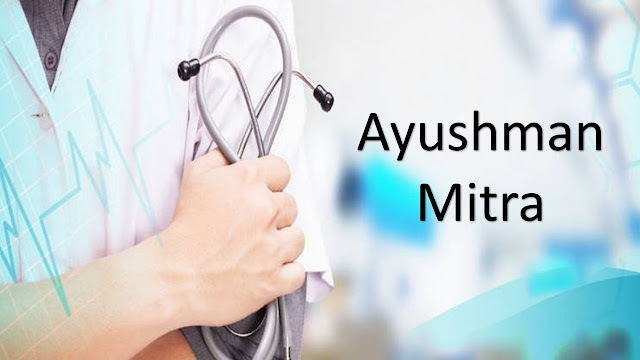 It is highly advisable to go for regular check up to ensure the safety of the growing baby and mother. Visit the doctors after every 4 weeks (I am telling this from my personal experience) until 28 weeks of pregnancy and after this visit the doctors in every 2 weeks to ensure everything is going well. Having good sleep during pregnancy is important. Enough sleep makes feel the mother better and it also helps in the proper development of the baby. Try to go to bed early in the night to get good sleep. Sleep either on the left or right hand as shown in the picture. Left is recommendable as it relieves pressure from the back. Don’t take any sleeping pills during pregnancy unless it is recommended by the doctors. Don’t take too much tea, coffee, soft drinks, etc. Taking too much caffeine is one of the major causes of miscarriage, birth complications, low baby weight, etc. Smoking & drinking alcohol is very dangerous for pregnant women. It may increase miscarriage, birth complications, etc. It is always advisable to stop such things during pregnancy. 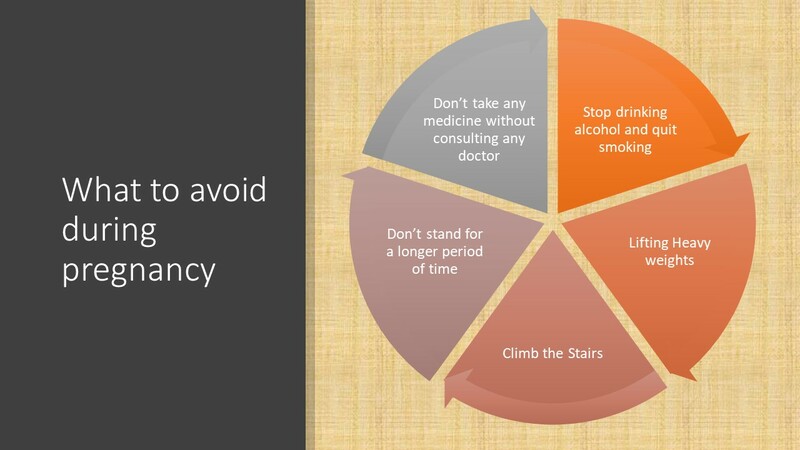 It is highly recommendable to avoid a few activities like climbing stairs frequently, lifting heavy weights, standing a long period of time, etc. Apart from this, don’t take any medicine without consulting the doctors. You may face some health issues during pregnancy but consult your doctors before taking any medicine. It is beneficial for both mother and baby. Don’t take stress during pregnancy. It will impact the mother and her child. Every couple is wishing for a healthy child. These pregnancy tips are very useful to have a healthy baby and it will help you in getting a healthy baby. Apart from these tips, I would like to share two more tips i.e. take blessing from the god every day and motivate yourself to make yourself fit during pregnancy. Whatever I wrote in this post is my own opinion. I have visited some ladies to understand their situation when they were pregnant. Based on their opinions, I compiled this post and sharing with you guys. Don’t follow these steps blindly. These tips are very helpful during pregnancy but at the same time, it is recommendable to consult with the doctors while the following anything. 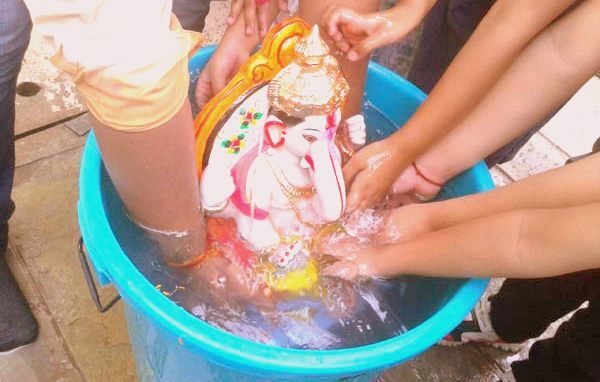 How can we celebrate eco friendly Ganesh Chaturthi? 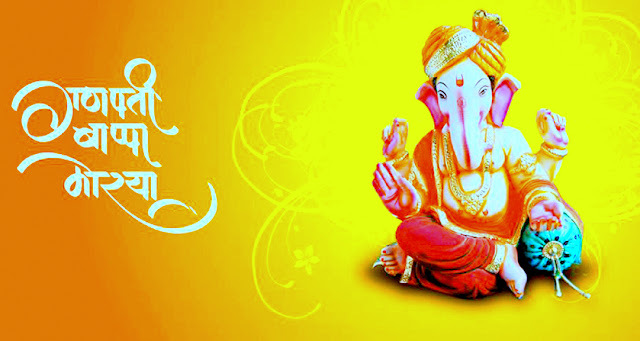 Social Posts wishes you all a very happy Ganesh Chaturthi & in this post, we will discuss the right way to celebrate the eco-friendly Ganesh Chaturthi. Before going to start the discussion, let's sing a famous line of Lord Ganesha. "Ganpati Bappa Morya Mangal Murti Morya"
I believe God is the biggest power present in this universe and having believed in GOD and celebrating God festivals is essential in our life. God gives everything to us and nature is one of them. Being a Hindu Brahmin, we have more than 33 crores Devi Devta and respecting everyone is our moral, social and religious duty. Do you know? for whom I am talking about here. The answer is Jal Devta (Water in God form), Vaau Devta (Air in God form) and many more. On the auspicious occasion of Ganesh Chaturthi, we bring idols of Lord Ganesha at home. We do worship, listening spiritual songs, offering flowers & modak to Lord Ganesha for 10 days and on the 11th day, the biggest day of this festival known as Anant Chaturdashi put these idols into the river. Putting Idols into the rives causes water pollution as well as disturb the life cycle of marine species. The ritual of Ganesh Visarjan during Ganesh Chaturthi is a very huge event where the huge idol of Lord Ganesha put into water. 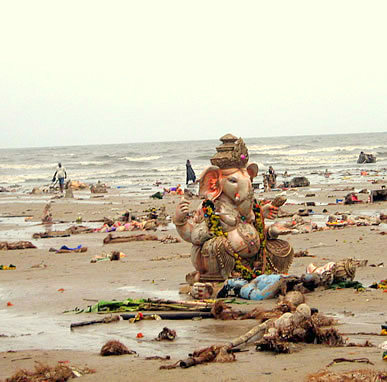 Let’s discuss how the Visarjan effects marine life. 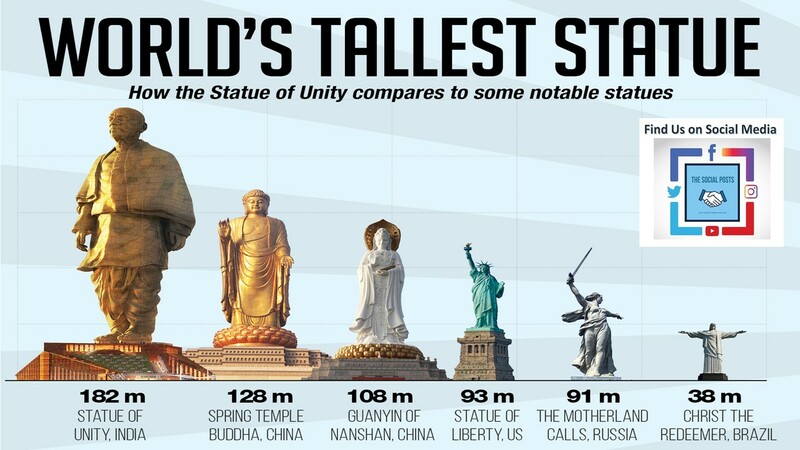 • Usually, these idols are made of plaster of Paris (POP) which is very harmful to the water. These idols take several years to completely dissolve into the water and till that time, these particles move freely in the water bodies. The marine species eat these particles that eventually kill them. • Along with the idols, other materials like flowers, decoration materials, polythene bags, plastic, etc. put into the river as well. It only increases water pollution and impacts marine life. • These idols are made of several chemicals and these chemicals reduce the oxygen level of water. Due to this, marine species are unable to breathe causing them to die. 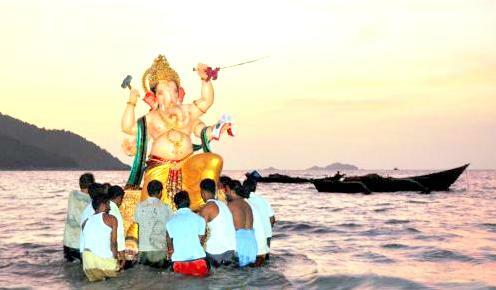 Here now our question is “What is the Right way to celebrate environment-friendly Ganesh Chaturthi”? Here, we are suggesting a few solutions so that we could protect the water from pollution. • Start making idols of Lord Ganesha from eco-friendly materials. If you immersed eco-friendly idols into the water, the harmful impact would be very less. • Make a small pond at your home and dip the Lord Ganesha in that water only. • Metal or brass can be used to make the idols of Lord Ganesha and it can be used repeatedly. 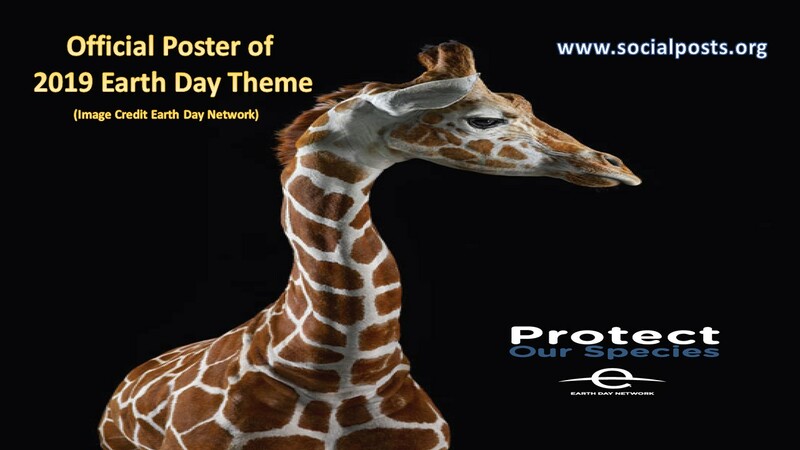 It is our nature and protecting our nature is our prime responsibility. It is a precious gift given by God. Now it is up to us, how do we take care of our mother earth. Whatever I wrote in this post is my own opinion. If due to this post, you feel hurt then please forgive me. Thanks for reading our article. Please share it with your friends, family, etc. through several social media platforms. Also, share your thoughts with us in the comment box section. Are we in dreams? Do you know, why am I asking this question? Before answering the question, I would like to share a story with you guys. This story is related to me. I am talking about those days when the creation of Aadhar card just started in India. I lived in Delhi and one day, I woke up early in the morning around 3 a.m. and went to the Aadhar center around 4’o clock in the morning. I stood in the queue and there were already more than 50 peoples in the queue. I stood over there throughout the day and at the end of the day, I was not able to get my Aadhar card due to the chaotic situation at Aadhar center. If someone will come to my home and help me to get government documents like ration card, voter ID card, Ration Card, Driving License, etc. at home, then it looks like the dream only. This dream has become a reality now. Thanks to the Delhi Government led by Mr. Arvind Kejriwal, the CM of Delhi. 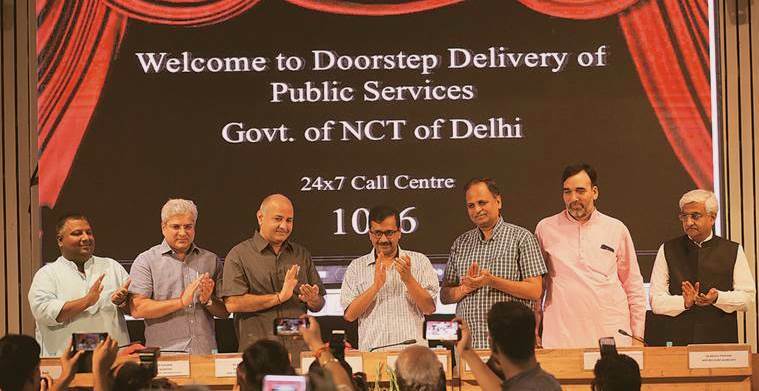 The Delhi government has launched a scheme of doorstep delivery of approx. 40 government services like caste and marriage certificates, Driving License, new water connection, etc. in the 2nd week of September. Under this scheme, no citizen of Delhi would have to stand in queues for the services listed and it is expected to make a huge impact on the middle class in the national capital. What is the home delivery of public services? After reading the story, it is very clear that availing public services is a very hectic process. It requires both time and energy. The major reasons behind such lethargic services are long queues, mismanagement of the process and many more. To address the problem, The Delhi government has started a very good initiative to launch the doorstep delivery of all public services. To facilitate this service, Mobile Sahayaks will visit the applicant’s house and collect all the required documents for a nominal fee. They will be equipped with necessary machines such as biometric devices and a camera. What are the services covered under this scheme? 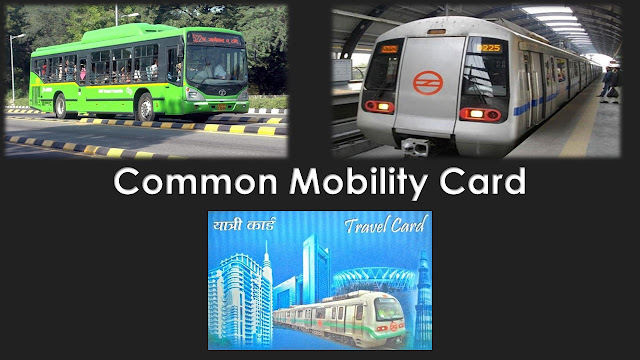 Under this scheme, services which are included are Caste certificate, Registration of marriage certificate, Delhi family benefit certificate, Duplicate registration certificate, Learner’s license, Driver’s license, Change in name/address in driver’s license or RC, Old age pension scheme, New water connection, New sewer connection, etc. What is the process to avail of this scheme? This service is available to all the residents of Delhi. If you want to avail of this service, just make a call on 1076 and fix an appointment to get the desired service. By making calls on this number, you will also get the information related to the required documents required to avail this service. On the scheduled day or time, an executive will visit your house to get the work completed. A very nominal fee of INR 50 will be charged for availing the service at your home. 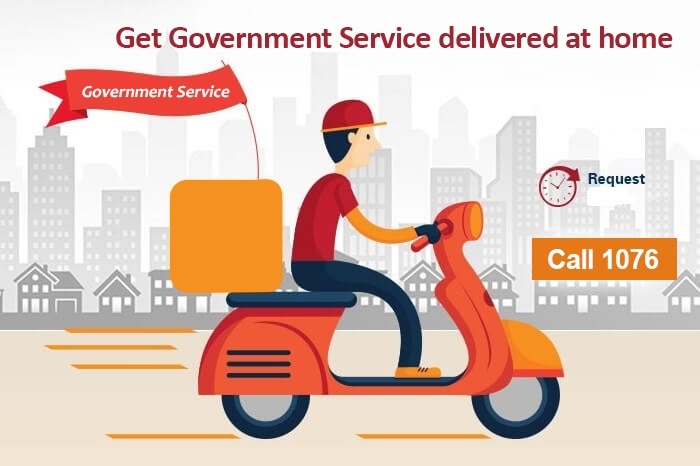 There are several features of the Doorstep Delivery of Government Services. The most important is that the life of Delhi citizens become a little bit easier. 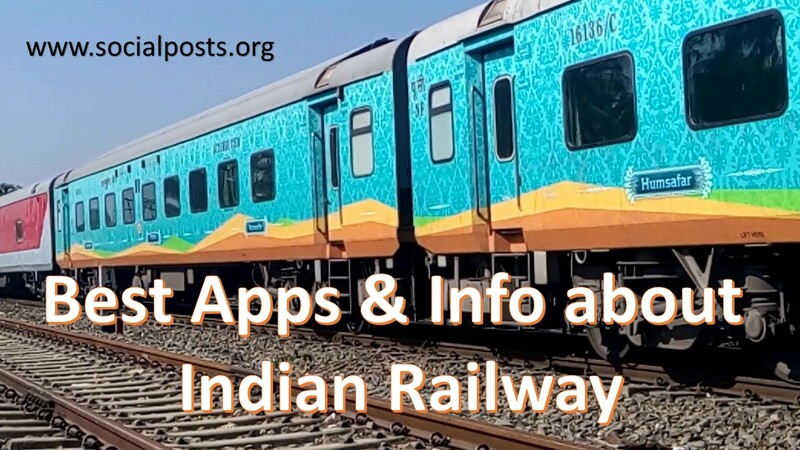 Other features of this service are as follows. • This scheme includes the delivery of government services at the doorstep. • In the first phase, approximately 35 services would be provided for a nominal charge of Rs. 50. • The number 1076 is linked to the call center where citizens can make appointments for the service providers to visit their home. • A chain of Mobile Sahayaks serve the mobile government desks, visiting the homes of citizens. • The contract has been given to VFS Global for a period of 3 years. They are responsible to set up the call centers and hire the Mobile Sahayaks. • The service is available from Monday to Saturday from 9 a.m. to 9 p.m. There are several dreams in the minds of every citizen of our country. One of the dreams of the Delhi citizen has become the reality now and from now onwards, no need to stand in queues to avail the public services. We all are hoping that many more positive things will happen in the all over India soon. Thanks for reading our article. What do you want from your government? Please share with us and our readers in the comment box. What is the history of National Technology Day? 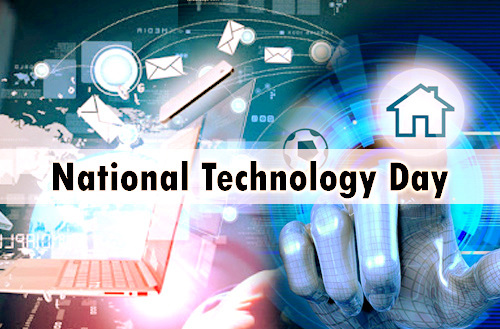 National Technology day is one of the important days in the history of India. It is a national event observed every year on 11 may remind the anniversary of the nuclear test conducted in Pokhran in 1998. On 11 May 1998, India successfully tested the Shakti-1 nuclear missile at the Pokhran and after two days, two more nuclear missiles successfully tested at the same place. The entire operation was led by our late president Dr. APJ Adbul Kalam. On the successful testing of multiple missiles, the prime minister of India Late Atal Bihari Bajpai declared India a nuclear state making it the sixth country to join the club of nuclear nations. It was not the single event happened on that particular day. Apart from nuclear tests, two more activities happened as mentioned below. 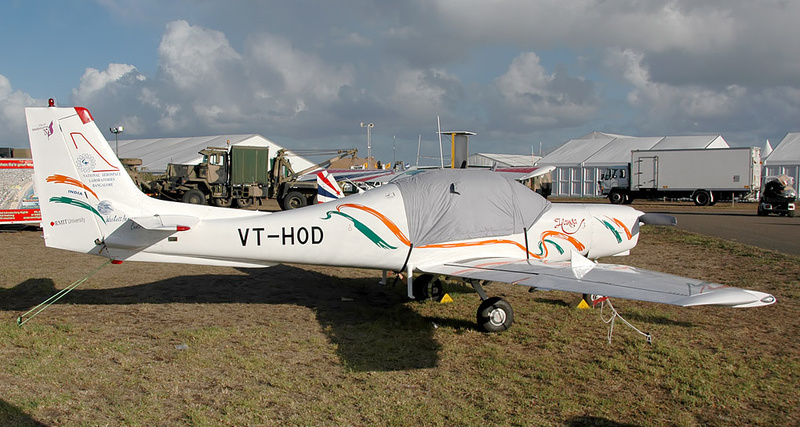 ● On the same day, the first native aircraft of our country, the Hansa-3, was flown in the Bengaluru. It was developed by the National Aerospace Laboratories (NAL), a Council for Scientific and Industrial Research (CSIR) lab. The Hansa-3 was a light two-seater aviation plane used in flying institutes for pilot training, sports, surveillance, aerial photography, and environment-related projects. ● Apart from these two activities, the Defence Research and Development Organisation (DRDO) completed the final test-fire of the Trishul missile after which it was inducted into service by the Indian Army and Indian Airforce. Trishul is a short range surface to air missile developed by India. Our Late prime minister Atal Bihari Vajpayee declared May 11 as the National Technology Day to celebrate the achievements of the scientists, engineers, and technicians of our country. To celebrate the success of National Technology Day, the president of India gives awards to the companies and individual for adopting new technologies. Several other events like lectures, competitions, quizzes, presentations and interactive sessions on different aspects of science are organized in various engineering colleges and technical institutes to mark the occasion. In 1974, the first nuclear test was conducted at Pokhran in the Rajasthan with a code name of Smiling Buddha. The next nuclear test was conducted by India in 1998 under the supervision of Late Dr. APJ Abdul Kalam and codename of this test was Shakti. In this test, 5 explosions of nuclear bombs were conducted at the Pokhran test range of the Indian Army. Out of these 5 bombs, the first one was a fusion bomb while the other four were fission bombs. The fission bomb uses the isotopes of uranium U-235 and Plutonium P-239 while the fusion bombs use the isotope of hydrogen. It is not possible to underestimate the importance of technology in the present world. Technology has influenced every individual and for the development of any country, technology is very crucial. Continuous development in technology is required to make our country prosperous and economically developed.